Check out our latest email newsletter. 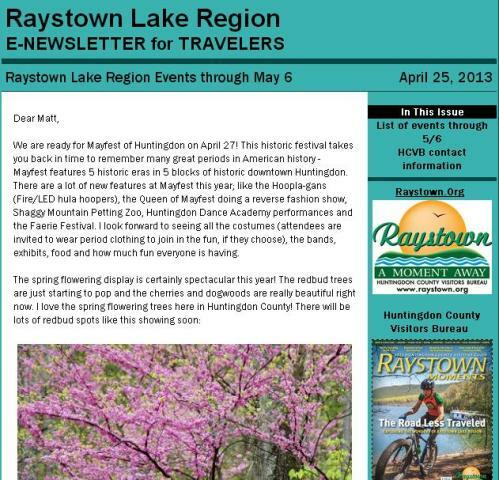 We regularly communicate with subscribers about events happening in the Raystown Lake Region. Check out our latest email newsletter. If you would like to get future newsletters in your inbox, please click the subscribe link. 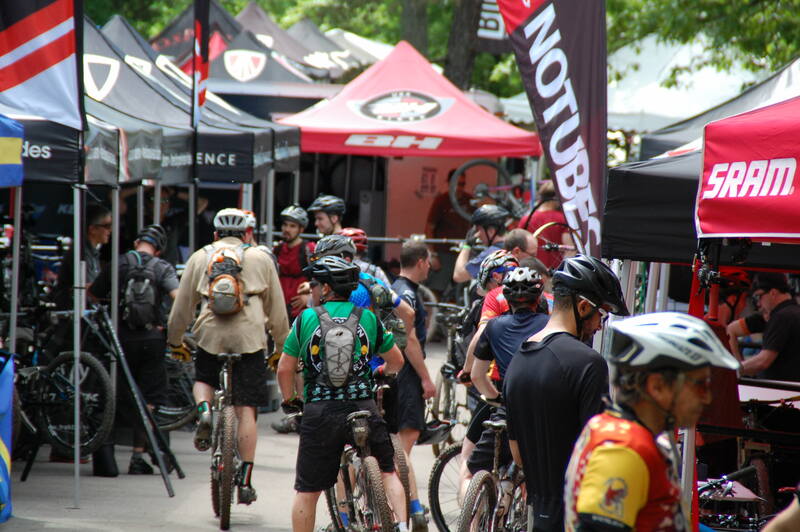 Attention campers and mountain bikers…..we have an exciting change for you! The Friends of Raystown Lake has made the decision to extend the open season for the Susquehannock Campground. In the past Susquehannock Campground closed after Labor Day. 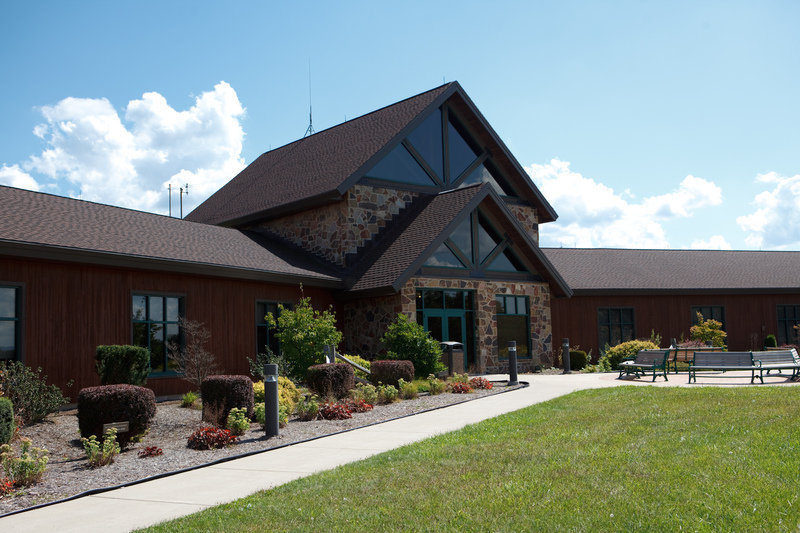 For 2012 the Friends will keep the Susquehannock Campground open until October 29th. After Labor Day all sites in Susquehannock will be available on a first come first serve basis. Can you imagine a better way to access the amazing fall foliage? At about 10am this morning, some of the best mountain bike racers in the United States will be converging on the Allegrippis Trails at Raystown Lake for day four of the Trans-Sylvania Epic Mountain Bike Stage Race. This event, in its third year, is a project of The Outdoor Experience Organization, and has become wildly popular in the off-road bicycle racing community. The month of May is both National Tourism Month, and National Bicycling Month. The tourism industry and the bicycling community have formed a fantastic synergy in the Raystown Lake Region of the Alleghenies. 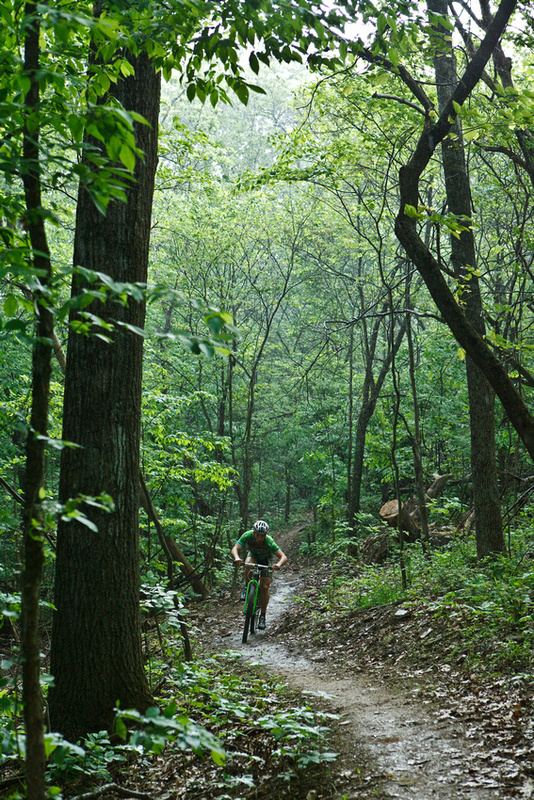 In 2009, the area opened its arms to mountain bike enthusiasts with the grand opening of the 32-mile Allegrippis Trails at Raystown Lake, a phenomenal addition to what was already a very popular biking destination for both on and off-road riders. In the past year, the US Army Corps of Engineers has estimated that the Allegrippis Trails system has attracted over 26,000 visits. Assuming that the trailhead visitation mirrors the normal visitor trends at Raystown Lake, it can be safely estimated that about 9,000 of these visitors travelled more than 50 miles to reach the trailhead along Baker’s Hollow Road, and combined spent a more than $1.3 Million while in Huntingdon County. The weekend of May 18-20, 2012, more than 1,200 mountain bikers will be converging on the Huntingdon/ Hesston area for Dirt Rag magazine’s DirtFest. This will mark the third year in a row that the magazine has chosen the Allegrippis Trails at Raystown Lake as the location for their signature event. The following weekend, begins the Trans-Sylvania Epic mountain bike stage race. The seven-day race is based out of Seven Mountains Boy Scout Camp, and will follow routes through Bald Eagle and Rothrock State Forests, as well as remote starts in R.B. Winter State Park and on the Allegrippis Trails at Raystown Lake. This event, also in its third year, will draw some of the top talent in mountain bike racing to our area for an entire week. The Huntingdon County Visitors Bureau is asking any and all businesses in the area that have marquees to display a “Welcome Mountain Bikers” message for the weeks of May 15 through June 4. We are also asking drivers to be extra-cautious on area roads, as we will expect to see an increase in bicycle traffic during this time. The bicycling community has a strong track record of economically supporting the communities that are friendly to their sport. Please join us in welcoming them to Huntingdon County, and inviting them back to ride again! Publisher’s Note: This article appeared in the 2010 edition of the Raystown Lake Region/Huntingdon County Visitors Guide. The Allegrippis Trails at Raystown Lake officially opened to the public in May, 2009, and have been wildly popular ever since, receiving national attention from National Geographic Adventure magazine, Men’s Journal magazine, Dirt Rag Magazine, Bicycle Times and many more media outlets. Frank Maguire is now the Mid-Atlantic Representative of the International Mountain Bicycling Association. If you have been coming to Raystown for years and have wondered what lay in the woods beyond the lakeshore, a new trail system will give you the chance to find out. The Allegrippis Trails offer a variety of experiences as they wind through old oak groves and young pine stands. From lakeside trails to breath taking vistas, the trail system rolls along the contours of the hills, never getting too steep to try. But what is really different about these trails is that they are built to be enjoyed from the saddle of a bike. 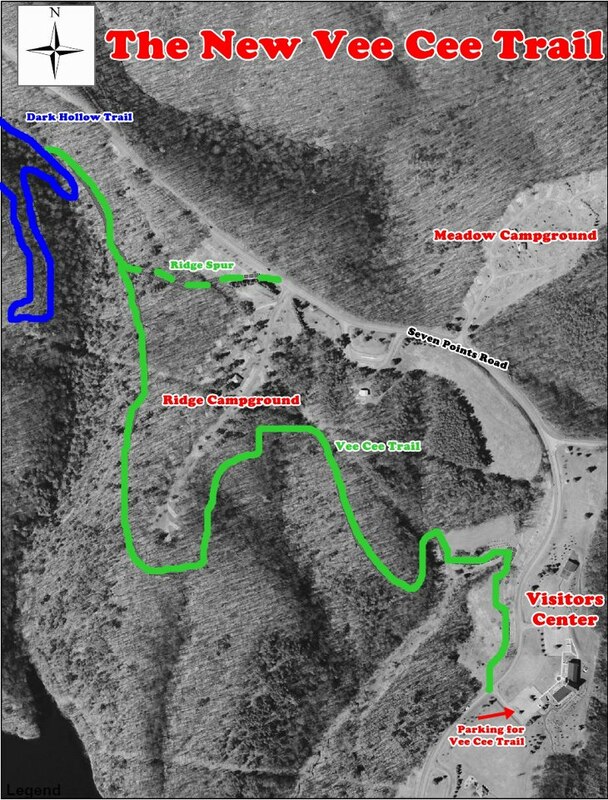 The possibility of building trails designed for mountain bikes (but able to be enjoyed by many others) at Raystown Lake first came to light in 2002, when the Army Corps of Engineers and the International Mountain Bicycling Association (IMBA) signed a national memorandum of understanding. This MOU set the groundwork for future cooperation between the Corps and IMBA, and specifically mentioned Raystown as a pilot area. With its miles and miles of shoreline slopes, Raystown was the perfect blank canvas to become home to destination mountain bike trails. “We’re excited to create a model trail system in Central PA.” said Rich Edwards, of IMBA Trail Solutions. “This is a notoriously rocky part of the state. These trails offer plenty of variety and will definitely help expand the riding scene”. What a model trail system means is that beginner, intermediate and advanced trails are all clearly marked, laid out as stacked loops. The beginner (or green) trails are closer to the parking lot, and it’s possible to ride these and get a taste of what the whole system holds. Off of this initial loop are options to extend the ride on intermediate (blue) trails, and further on to the black or advanced trails. The visitor gets to decide how much to bite off, and if they got more then they bargained for, the parking lot is just a short ride away. But what about the fun? All the planning in the world is wasted if the trail is boring. Allegrippis doesn’t disappoint and as one person put it at the grand opening, “I couldn’t stop giggling.” Evan Gross, President of the Raystown Mountain Bike Association and the trail guru, put it this way. “People have been coming from around the country and from all these different riding backgrounds, and each one gets off the bike smiling”. What causes the excitement is the flow of the trail, the feeling that you are on rails. The way the trail twists and turns, leads you to think that you are on a slot car. The best part about this is that each rider finds their magic speed, so no matter your ability, the sensation is the same. At the heart of the trails is sustainability, both environmental and social. The trails are designed to meander about the hills and ridges, never running straight up and down the slopes. This means they will survive years of use without eroding, as erosion is a factor of water over time. Bicycle wheels and human feet just speed the process up when the trails aren’t designed right. One of the first things visitors notice about the trails are the grade reversals, the fancy term for the dips and bumps that gives the trails their rollercoaster feel. These act as insurance policies, so that water keeps moving across the trail, rather than down it. The social sustainability part of the trails is the fun. 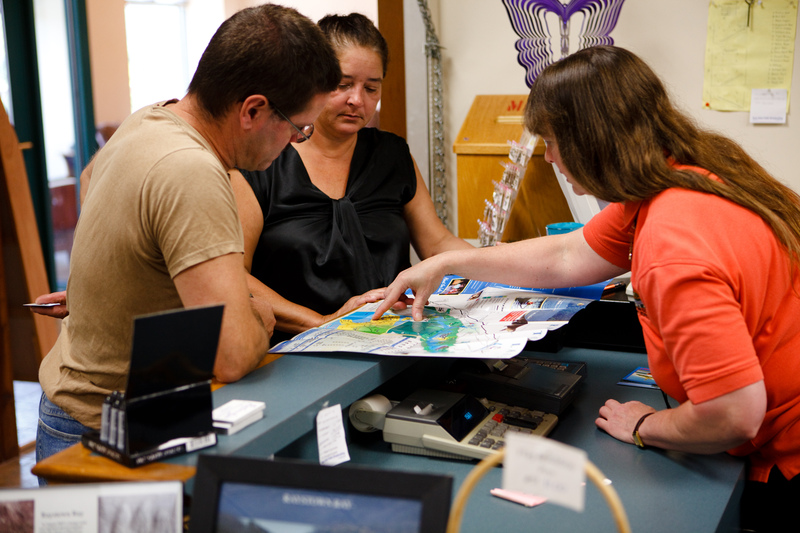 A visitor can decide to try out the trails and not fear getting lost or in over their head. 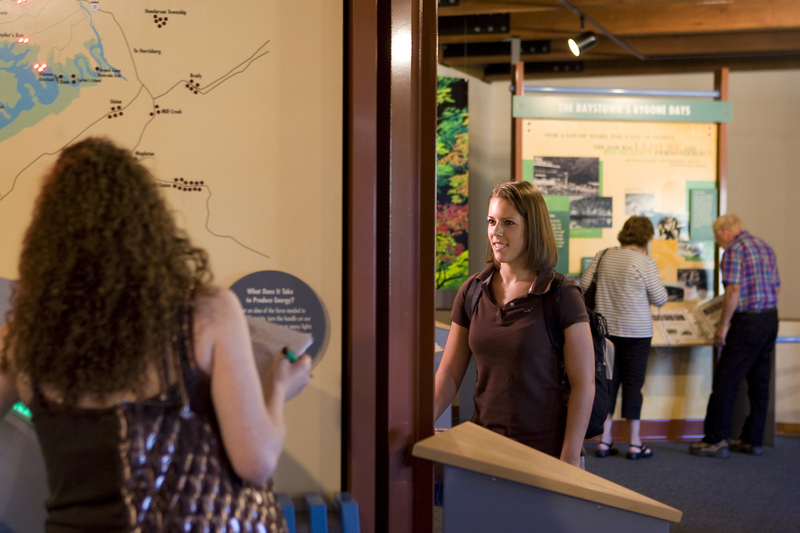 By making trails that can be enjoyed by the largest number of users, and making a unique experience, the trails invite people to get involved and keep coming back. This is good for the community and the region as a whole. For IMBA, this project has been a great chance to showcase our trail knowledge and provide a much needed destination. 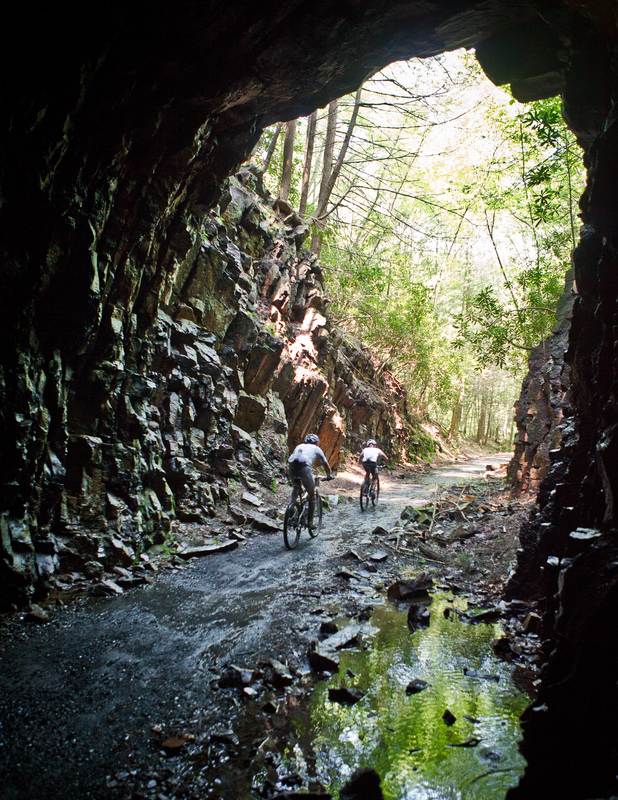 Mountain biking is one of the most popular outdoor activities, with some 1.4 million people riding trails at some point every year in Pennsylvania. Raystown was the unique chance to build close to a large portion of the US population in a place that has special natural beauty. Already in its first season, the Allegrippis Trails have been a huge success, with visitors coming from throughout the east and as far away as Hawaii and Scotland to ride. Evan Gross, after attending Juniata College, decided to call Huntingdon home and be a part of the burgeoning trails community. 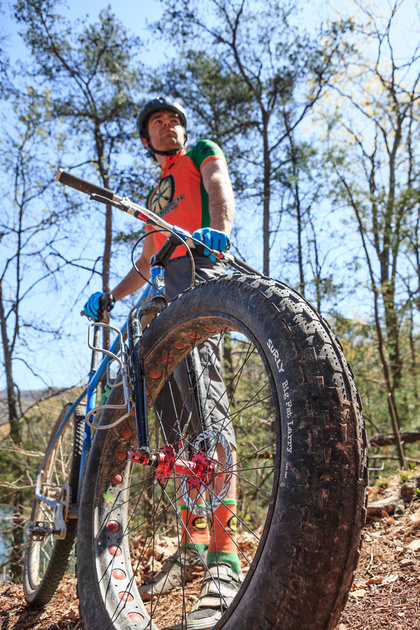 As President of the Raystown Mountain Bike Association, he is both caretaker and trail ambassador. “It’s amazing to see the pull these trails have on people around the country” Said Evan, when asked what has been his biggest satisfaction with the trails. “It feels like Huntingdon is becoming a real trails town”. If you want the local skinny on how best to enjoy your visit to the Allegrippis Trails, seek out Evan, you’ll be glad you did. The Huntingdon County Arts Council will feature works of art relating to bicycles in April at its Art Space exhibit gallery in downtown Huntingdon. Photographer Abram Eric Landesof the Washington, D.C. area will be on hand with his sports photography, in particular action shots of bicyclist scaling various mountainous terrains, weather and obstacles that have propelled cycling into the realm of extreme sports. 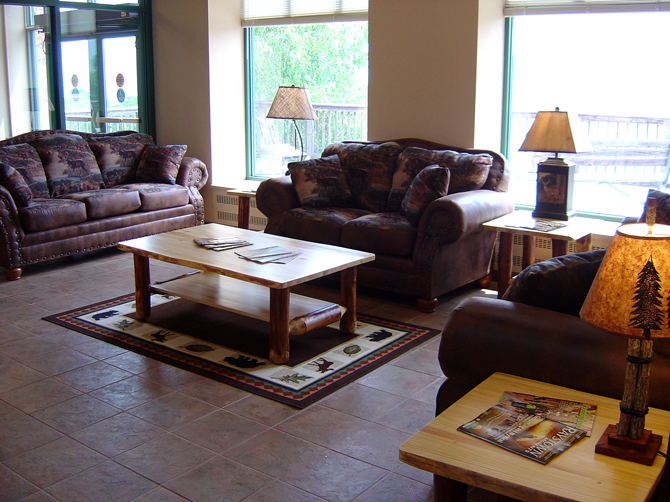 His work has been published in magazines, including Dirt Rag, Mountain Bike, and Bicycling Magazine. Evan Gross, whose college days as an environmental science major with a secondary focus on art were spent at Juniata College in Huntingdon, will be the other featured artist in the exhibit. More recently, Gross is known as one of the faces at Rothrock Outfitters‘ bicycle department. An avid bicyclist, he enjoys the connection of lifestyle choices and the arts. Coming to full circle, he has been creating mobiles made of bicycle parts. “It’s all about revolution” Evan says, referring to gears, recycling, bicyclingand healthy living on a local level. An artist reception is scheduled for the second Friday, April 13, 2012, from 6 to 9 pm. The exhibit will be open to the public April 10-24, 2012. Open hours are Tuesdays 2 pm to 6 pm, Thursdays and Fridays 11 am to 6 pm, and Saturdays 11 am to 4 pm, and by appointment other days. The Art Space is located at 212 Fourth Street, Huntingdon, PA 16652. Call (814) 643-6220 for more information. The Huntingdon County Arts Council is dedicated to providing art and cultural opportunities in Huntingdon County. Our programs are designed to provide enjoyment and enrichment as well as educational and professional opportunities to the general public, students, amateur and professional artists. The council’s website is: HuntingdonCountyArts.org.